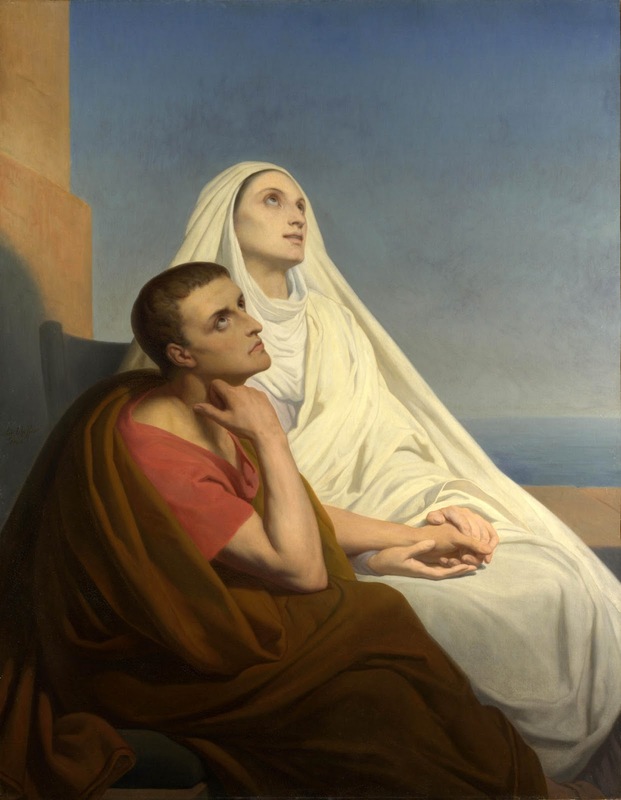 Augustine and Monica, Ary Scheffer, 1846. Monica, the pious, long-suffering mother of Augustine, for whose soul she shed many tears because her greatest desire was to see him leave behind the Manichean heresy and become a baptized Christian, was not only a terrific mother but, as Augustine tells in his Confessions, she was also an infinitely patient and loving wife to a difficult husband (the unbelieving Patricius, for whom Augustine seemed to have little affection), and a wise and devoted daughter-in-law to a woman who otherwise might have made life even more difficult for her and her husband. To our modern sensibilities Monica probably put up with more than she deserved from Patricius, but then again, this was a pious woman who put her faith and the covenant of marriage above her own temporal comfort and happiness. Whether male or female, we can all learn from her example. “She never ceased to try to gain him [Patricius] for you as a convert, for the virtues with which you had adorned her, and for which he respected, loved, and admired her, were like so many voices constantly speaking to him of you [God]. He was unfaithful to her, but her patience was so great that his infidelity never became a cause of quarreling between them. For she looked to you to show him mercy, hoping that chastity would come with faith. Though he was remarkably kind, he had a hot temper, but my mother knew better than to say or do anything to resist him when he was angry. If his anger was unreasonable, she used to wait until he was calm and composed and then took the opportunity of explaining what she had done… Many women…used to gossip together and complain of the behavior of their men-folk. My mother would meet this complain with another – about the women’s tongues. “…Her mother-in-law was at first prejudiced against her by the talebearing of malicious servants, but she won the older woman over by her dutiful attentions and her constant patience and gentleness. In the end her mother-in-law complained of her own accord to her son and asked him to punish the servants for their meddlesome talk, which was spoiling the peaceful domestic relations between herself and her daughter-in-law. Patricius, who was anxious to satisfy his mother as well as to preserve the good order of his home and the peace of his family, took the names of the offenders from his mother and had them whipped as she desired. She then warned them that anyone who told tales about her daughter-in-law, in the hope of pleasing her, could expect to receive the same reward. After this none of them dared to tell tales and the two women lived together in wonderful harmony and mutual goodwill.” (194-195).